Grinding can be effective just by touching it lightly. Wet grinding is effective.Please use a small amount of oil., Grinding can be effective just by touching it lightly. Wet grinding is effective.Please use a small amount of oil. I am happy that I can buy a file of Tsubosan with stability from one file. This review is about item#5832224. It seems good to use with oil. Although it was said that, because the file of the file was diluted, "forgive" in his own use, it was a bit unsuitable for sharpening the tip of the punch. We recommend you to sharpen flat objects than sharp objects. This review is about item#05832251. Files are rather expensive items, and there are five sets of items in this price range, but it is quite a bit different when it comes together as a single item. It can be shaved smoothly with a light force, and the finish is perfect. 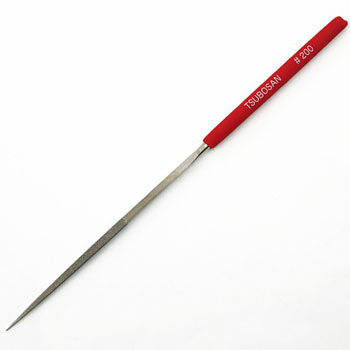 It is recommended for ordinary diamond file not oriented enough. This review is about item#05832303. Grains are in line and a pleasant sound is made. It is like a trick to put cutting oil on and use it without putting strength. If the shape is rough, make the shape of the company's K type beforehand, use this as the main and use the company's special DIA file S # 400, # 600 for the finishing. Since the bonding state of the diamond is smooth, the polished surface is good. This review is about item#05832242.